Now that my supercharged 75's transaxle holds up well i want to upgrade it a little. What do you guy's reccomend? I already started with the middle bearing plate. It's gonna be milled from a 7075t6 aluminium. I don't know the axial load forces axact but aplying a 500 kg load disorted it 0.04mm. 1000kg 0.08 and 1500kg 0.12mm.nice linear. Also i saw it already was bent a bit in load direction. 0.015mm that could be machine error but i think its a lot I think this load 'play' is the pignion killer...? Maybe i'll make a batch. -Also adding housing stiffnes would be nice i guess. Welding up aluminium or a steel brace style one...? This all to give it some a little bit more strenght. 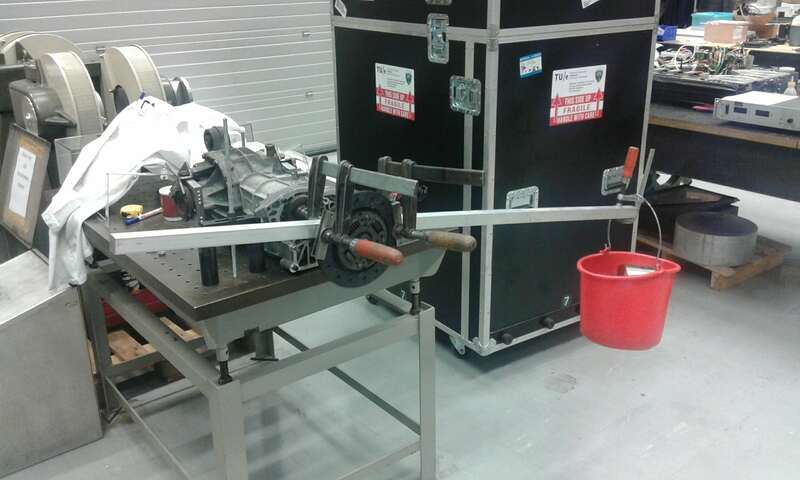 Think of a way to clamp the gearbox halves together. When you applie a lot of power on the angled teeth of the gears you'll see that they try to push eachother apart. 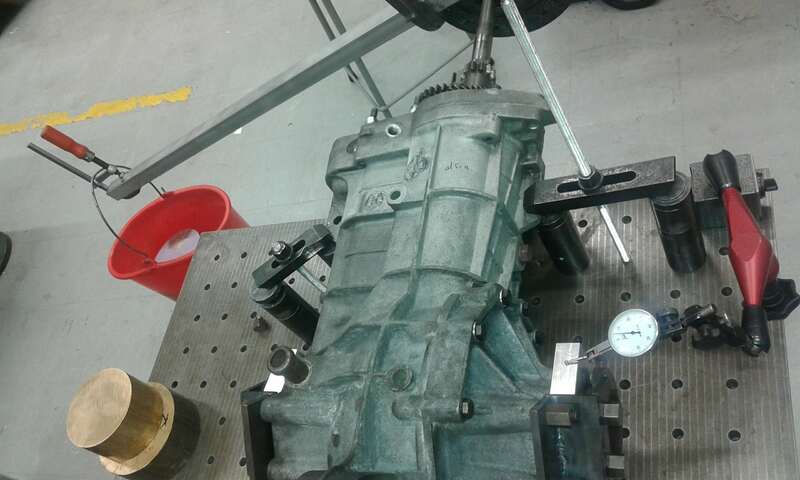 And if all fails you can always mount your 928 gearbox.. The gears themselves don't push the gearbox halves apart because their axial bearings are all in the centerplate. So stiffening that plate would prevent it from 's' shaping. 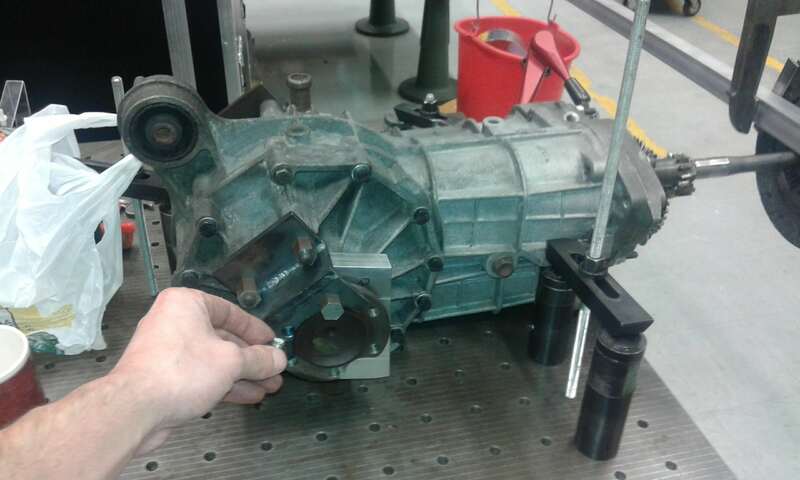 Only the pignion gear from the diff does put's load on gearbox halves. That's an excellent solution . Pinion float from tiny deflection was always th killer under serious abuse on the track . Twin plate unsprung GTV clutch with 0.9mm skimmed off each side of intermediate plate worked well with 350 hp . Lighter than single plate and handle more torque . Clutch bracing - taken from Mds knowledge shared on forum . One other option i forgot to mention , for the flange , are the intergrated mounting M8 hole's for a full gearbox brace in cobination with the above discribed clutch housing brace . Each side has 3 of these mounting points. Very nice project GTV-racer. I never thought about the possibility of that bearing plate flexing and changing the ring and pinion mesh. Some testing the to see how much better the new flange is. is very conservative i think. Beqause shock loads will be much higher i guess. weight at 1 mtr from the centre of the input shaft. The result was linear and it shows 0.075mm disortion of the bearing plate and a housing flex of 0.05mm at the diff end. Next test. New made flange and gearbox brace against housing flex. for the brace you can already see the new mounting points at the output shafts. This is the sort of stuff, like MD's clutch housing brace, that helps the Alfa community progress and stay in 1 piece. It's probably a bit hard to get across to people in other parts of the world, but here in Aus, there weren't that many Alfa's sold. So If I smash my 1990 75 Potenziata's transaxle in some way, it'll be both hugely expensive and time consuming to replace it. Prevention is much better than cure, so learning what is happening is hugely helpful!!! So it will be interesting to see how much flex/distortion there is with the new centre plate. diff side plate to further resist case flexing??? That's exactly where the new mounting holes are for in the new flange. 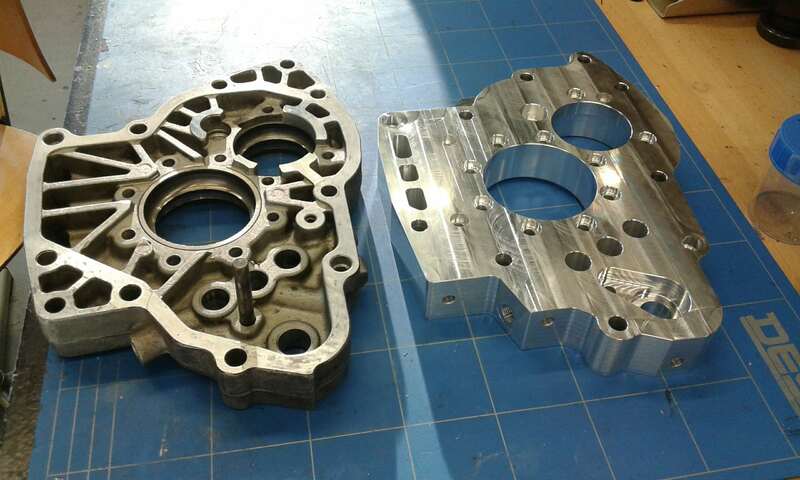 The new flange i milled is from 6068 t6 aluminium wich is a lot stronger. Did some tensile testing on the old aluminium flange! It was about 3 times less stronger. And the new one is a solid plate so it should be more than enough. Now i VERY sure this flange and the brace is the way to go! So 32 kg-m (231 lb-ft) will cause distortion by 0.05mm? Is that enough to cause serious problems? With your torque you will probably have more distortion. Seriously interesting stuff. The Cab racer has just lost 3 dentures off the pinion after 2 years behind the supercharger. I am following developments with keen interest. 75evo wrote: So 32 kg-m (231 lb-ft) will cause distortion by 0.05mm? Is that enough to cause serious problems? With your torque you will probably have more distortion. It's not engine torque that i'm worried about but the shock load defenitly is. Even for a race car with standard engine. Hi Gtv-racer, interesting to see your modifications taking place and very nice work indeed I do wonder if they are in vein though as I feel you are tackling the pinion alignment issue from the wrong end, literally! After looking at the abnormal wear on pinion and crownwheels I feel that shaft flex could be the main cause of many issues. I'm planning on machining the inside of the rear/Diff case flat on the gear cluster side and using a flat steel plate to hold a tapered bearing directly at the pinion. The bearing would be shimmed for pinion depth, this will take all the thrust load, directly at the pinion bearing mounting. With careful machining you can fit a narrow bearing and support between 2nd and 3rd gear to help the support the shafts mid way along their lengths. 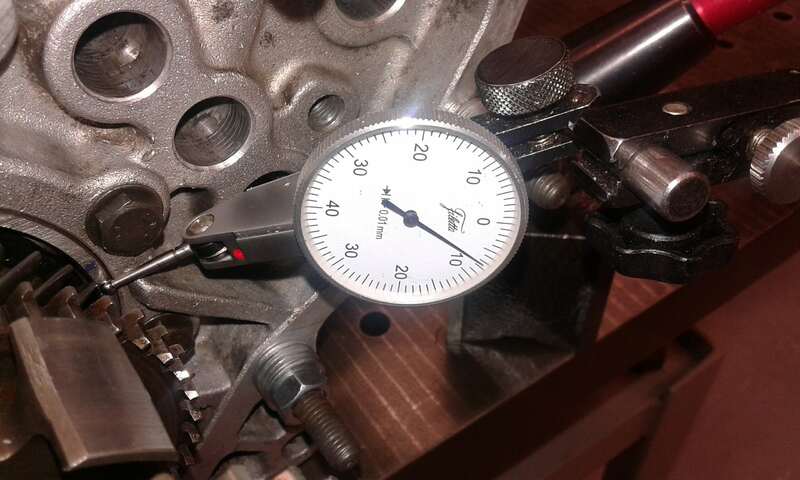 By using a loaded bearing at the pinion instead of a floating bearing also allows you to shim the intermediate bearing for a little preload on the pinion shaft as well which will aid in shaft rigidity just like a regular Diff setup. There is an off the shelf bearing in the right size to replace the standard floating pinion bearing, bearings available down to 6-7mm width for use between 2-3 gears. I think the radial forces on the rather long and inadequately supported shafts to be as much of an issue as case flex. After looking at a pinion and crownwheel from a 3.2 24v that had worn down the teeth to a razor edge, It appeared the pinion although setup well on the bench appeared to be running deep into the crownwheel teeth which could only happen through shaft flex or HUGE! case flex. Out of interest, do you have a cad program for the flange. If so could there be a possibility of a small run of these to be made?